Happy Monday! I thought I’d start this week off with a fun yeti card. It’s super cold here this morning, but at least we don’t have snow or yetis outside.Yet. 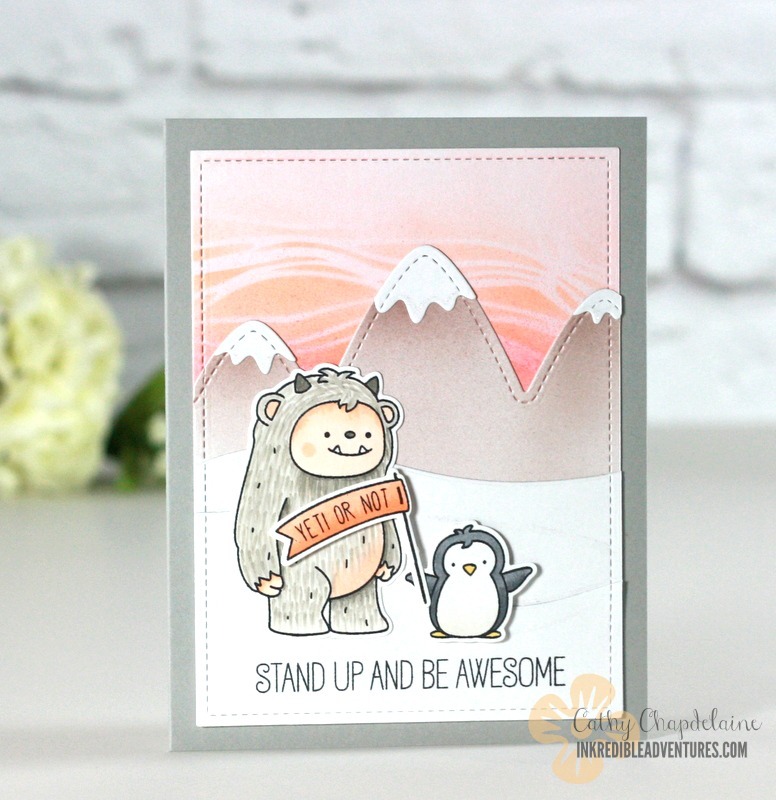 I’ve used the adorable Get Yeti stamp set from Neat and Tangled and started with the sky background of the card. First, I die-cut a piece of white cardstock using the largest die in the Lawn Fawn Small Stitched Rectangle Stackables set. 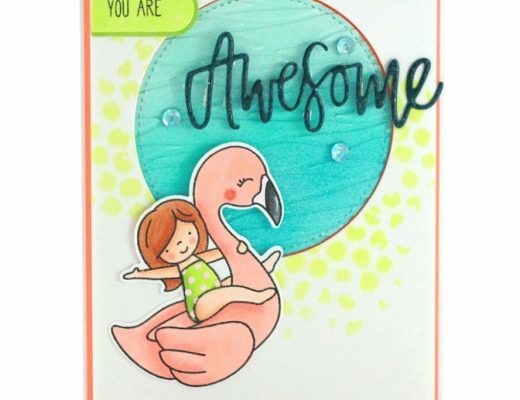 This measures 3 3/4″ x 5″. 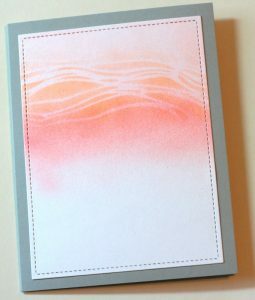 I airbrushed the sky with Copic R20 and R21 and then taped the Neat and Tangled Rice Paddies stencil across the sky, airbrushing over the stencil with YR61. I think this gave the sky a wintry sunset effect. 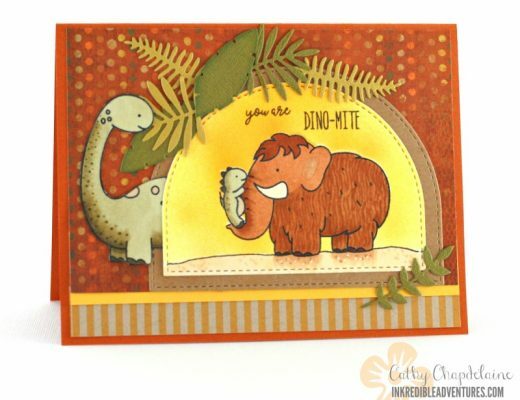 I then adhered this cardstock piece to my gray card base. Next, I die-cut another piece of white cardstock using the same Lawn Fawn Stitched Rectangle die and then die-cut the top of this piece using the Lawn Fawn Stitched Mountain Borders dies. 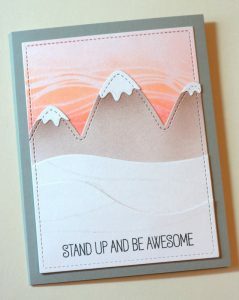 I airbrushed the mountains using Copic E70 and E 71, adhered the snow to the peaks and added a little clear Wink of Stella to the snow for a little sparkle. 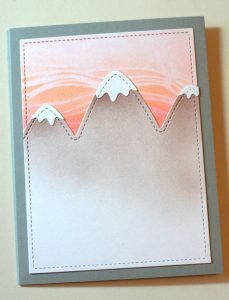 I adhered the mountain piece to the sky background piece lining up the bottom edges. I die-cut one more piece of white cardstock using the same Lawn Fawn Stitched Rectangle die and die-cut this piece twice with a My Favorite Things Snow Drifts die-namics die cutting one piece larger than the other. 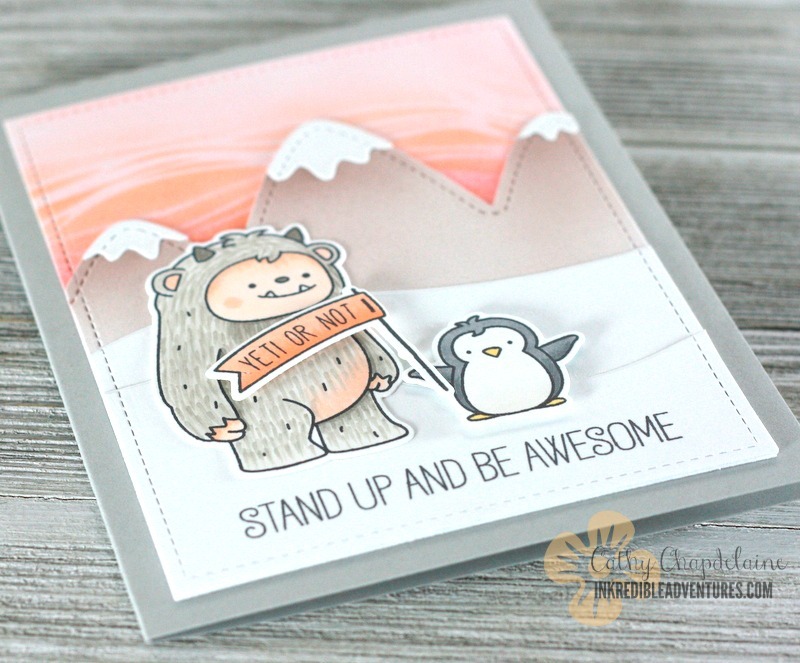 I stamped a sentiment from a My Favorite Things stamp set on the smaller snow drift piece. 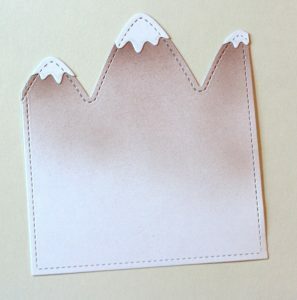 I then layered the snow drift pieces and adhered them to the mountain piece lining up the bottom edges. I also added clear Wink of Stella to the snow using an edge of the My Favorite Things Drifts and Hills stencil. 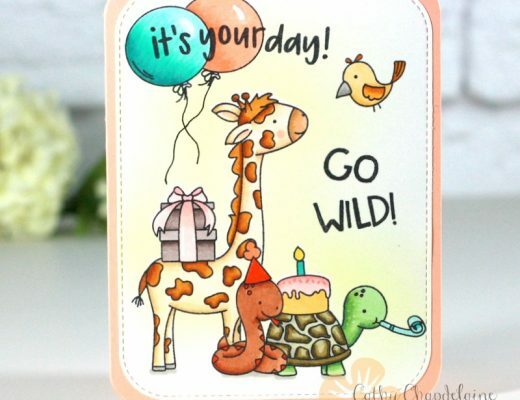 I stamped and colored the images with Copics and die-cut them using the coordinating dies to this set. I adhered the yeti first and then adhered the pennant and penguin using dimensional adhesive. 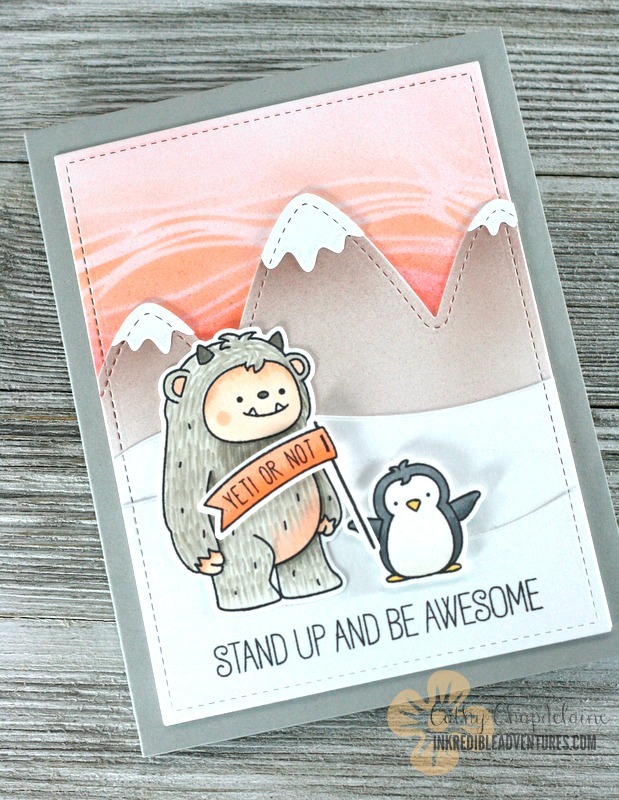 That cute yeti just makes me smile! Stay warm out there and thanks for stopping by!